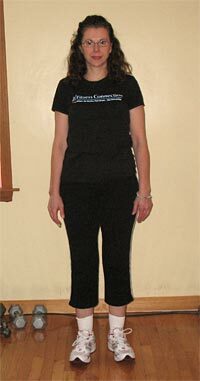 On January 5th, 2009, The Fitness Connection opened up a Transformation Challenge to all it's members. The purpose of the Challenge was to bring together women who wanted to lose weight and challenge them to stay motivated, eat clean, workout regularly and weigh in every week. I took the responsibility of keeping these Challenge members motivated both in person and by email and also by creating a forum of information which I tried to update regularly. The forum was designed to be a place that a Challenge contender could go to on-line for information, education and motivation. There was a place to ask questions, retrieve recipes and read a blog written by me that hopefully kept people informed and excited about their weight loss goal. 28 women joined the Challenge. Over the course of 7 weeks, these awesome ladies lost a total of over 150 pounds! 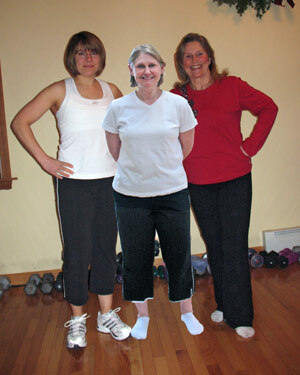 Below are interviews I did with the 3 "biggest losers", Laurel Brandon, Barb Irzyk & Kay Bagwell. It was a very close contest and Laurel literally won by only 1/2 a pound! She lost just over 10% of her body weight in 7 weeks. 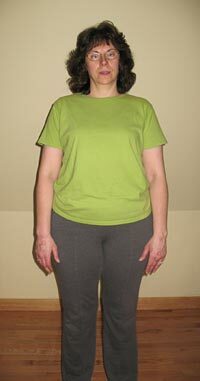 Barb Irzyk, the 2nd place challenger lost exactly 10% of her body weight. The third place challenger, Kay Bagwell lost just under 10% of her body weight. These numbers are all very strong. The typical and desired weight loss per week is about 2 pounds. All 3 top finishers averaged weight loss of more than 2 pounds/week. Let's find out how they did it! JOEY: Laurel, I'm so amazed by you. I have watched you get so strong this year and it's been so gratifying to watch your transformation over the last 7 weeks. Tell me a bit about who you are and why you joined the Challenge. LAUREL: Well, I am the mother of two children, Peter who is 14 and Maddie who is 10 and I have been married for 16 years to my husband Patrick. I am an RN and I work part time as a surgical nurse at Midstate Surgical Center. I knew that I wanted to lose some weight but I needed something to inspire me. I strength trained with you a few years ago and then started back at The Fitness Connection last winter. I had become frustrated with my weight and when I looked back over the past 14 years, I knew I had eaten healthy a lot of the time but I made room for lots of sweets (I love baking, chocolate and ice cream). I have always exercised (pilates, Jazzercise, walking, going to the gym, strength training), but not consistently and it certainly has felt more “chore” than “choice” a lot of the time. If I ate well…. then I was not exercising as much as I should be… if I was exercising a lot… then I wasn’t paying much attention to my food choices. I became a lifetime member of Weight Watchers back in 1994 but that was the last time I seriously worked at losing weight. Once my children came along, clean eating and fitness took a place in the backseat… I had occasional, not so serious, attempts at weight loss over the past 14 years but it never lasted and I never got back to my “lifetime goal” at Weight Watchers. I knew I needed to get it together but I just wasn't sure how to get really pumped up and motivated. Just before Thanksgiving, you mentioned that some clients wanted you to offer a weight loss challenge of some sort - at least a weekly weigh-in to help motivate them. I immediately jumped on the idea because I knew I needed something like that to get me going again. As you know, I really encouraged you to do this Transformation Challenge! Wasn't I the first to sign up?? With the start of the new year and the beginning of the Transformation Challenge…. I felt that at 40 years old and at my heaviest weight ever, IF NOT NOW, WHEN? I knew this time that the competition of The Challenge, the accountability of getting weighed in every week would allow me to take control and make it happen. I knew this was it! JOEY: You WERE the first to sign up. In fact, I don't think I would have done the Challenge without your encouragement! What was different this time? Why did this work for you? LAUREL: I’d have to say it was a change in my thinking on several levels. I realized that like most people… I try to avoid discomfort. I realized that I was never hungry because I was constantly eating to make sure I didn’t feel any hunger. I was eating many times throughout the day. I learned that it is ok to feel a little hungry. The feeling/discomfort usually passes. My husband who is a competitive cyclist had some good advice that has changed my thinking with regard to exercise. He said one of the things he has learned in training is that you can always go faster, harder and farther than you think. I realized that I had often been working out at a level well below my potential and had allowed myself to slip into the comfort zone while exercising. I was not challenging myself, nor was I incorporating the High Intensity Interval Training (HIIT) that you taught us about. JOEY: What can you tell the readers about your journey? How did you do it? What worked? Did you follow Weight Watchers this time? LAUREL: I think the biggest change I made was to PLAN. You drilled this into our heads and it is so true. Plan the night before, what you are going to eat the following day. Plan how you are going to exercise during the week. Know the night before what you are going to do for exercise the following day. If you leave things to chance like what you are going to eat or what you are going to do for exercise you are more likely to blow-off your workout or eat something that you will regret. The other big thing I did was to keep a food journal. Write down what you eat and keep track of your exercise on a calendar. Just like weighing in with someone once a week, it is a form of accountability. Also, if you have a bad day…. You get to start with a new page everyday. Regarding Weight Watchers, actually you introduced me to Tosca Reno’s EAT CLEAN DIET book and I really love the book and the way of life that goes along with it. As I stated earlier, I am a weight watchers person so counting “points “works for me. I like keeping track as I feel it gives me a sense of control. So I kind of created my own eat-smart strategy by combining the best of these two things. Mostly “eat clean foods” every 3 hours with journaling and point counting to keep track of how much. JOEY: I live and die by Tosca Reno's The Eat Clean Diet book. I'm so glad you not only love it too but you have been successful using the strategies of eating clean. As you know - I think it's the only way to loss fat and keep it off forever. It's just so darn doable - for lack of a better word! Now talk about how fitness fits in with your weight loss. LAUREL: Every week is a little different for me as far as exercise goes. I always do 2-3 days of strength training (usually with you or sometimes on my own) HIIT 3-4 times per week (via elliptical, treadclimber or run/walk intervals)and some combination of Jazzercise, Yoga, walking and I use the gym at work to fill in the other days and times I have available. Some days I exercise twice (AM and PM) and some days I rest. I do try to do something everyday even if it is just walking the dog. JOEY: What is it that keeps you motivated and energized to exercise especially on the days when all you really want to do is crawl back in bed or plop down on the couch watching television eating bon-bons? LAUREL: Being a part of the challenge initially kept me motivated but now I think it's I have come this far and if I stick with it … by this summer I could be in my best shape ever. Also, the positive comments I have gotten from friends and fellow Fitness Connection class members have certainly helped me feel motivated. JOEY: It is a great feeling to hear people tell you how great you look. I truly believe by summer, you are absolutely going to look HOT! I think if anyone can do it - it will be you! It seemed like you were on fire during this challenge. Every weigh-in was a good one. D id you have any stalls along the way? How did you do to keep your head in the game when that happened? Did you change anything about your routine from the norm? Do you worry about gaining back some of the lost pounds? LAUREL: I definitely had weeks where things were going on in my life and I felt worried about sticking with my goals. For some reason though, when I have a bad day I have been able to quickly regroup and stay the course. As you know, I joined your next Transformation Challenge that began March 2nd and I struggled to stay on track. But you really opened my eyes the other day when I told you I had hit a plateau. You asked me if I could honestly say that I was eating as clean as I was and really keeping track and my honest answer was that I wasn't. Right then and there, I knew what I had to do. I had to get real and put my heart back into it. I looked back in my journals and at my exercise calendar and it is very motivating to do that. So not only doesn't help when you are keeping track but it's moments when I need clarity that looking back helps me focus. I look at how far I have come and to look at all that I accomplished to get to this point. I recently got my spring/summer clothing down from the attic and was trying on the clothes that I wore last year. Almost everything is too big, especially the shorts and pants. It is such a good feeling!!! Regarding gaining weight back, I'm not worried. I truly know this time is different and what I am doing is working… I just need to keep doing what I am doing and not go back to old habits. And you have taught us to watch ourselves - whether it be weigh-ins or watching how clothes fit - I know I can't let it get away from me this time. I plan to catch it early and nip it in the bud before it starts playing with my head. JOEY: I'll say it again, Laurel! You amaze me. I am so proud of how far you have come. There is nothing more gratifying to me, as a professional, than to connect with someone who "gets it". You are definitely one of those people. Thank you so much for having faith in me and for pushing me to offer this Transformation Challenge. You put a smile on my face every time you stepped on the scale! And thanks so much for doing this interview. JOEY: Hi Barb! Congratulations on losing such a large amount of weight in just 7 weeks! I am so proud of you and also so happy because you worked so hard at it! Tell the readers about yourself. BARB: Thanks, Joey! Well - I live in Killingworth with my husband Jerry and our 2 dogs and I just became a grandmother which is so much fun. I also work in the Madison school system. About 2 years ago, I lost a considerable amount of weight when I first started with The Fitness Connection and then I gained it all back over the last year. My weight tends to go up and down based on the stress and events going on in my life. I often go down to a decent weight and then slowly gain it back. This time, I gained it back quickly – from stress or maybe my age. JOEY: What inspired you to lose the weight this time and how did you do it? BARB: This Transformation Challenge inspired me and I lost 17 pounds in the 7 weeks. It was definitely a combo of changing eating habits, exercise and internal motivation. I set rules for myself and stuck to them. I ate small planned meals throughout the day and did not vary my routine so I always knew what was going in calorie wise and protein–wise. If I did get bored, I concocted some vegetable recipes to keep me busy and filled up. Before I went to eat at friends’ houses, I told them my food needs and they understood and supported my efforts. When eating out, I knew what I was going to order before I arrived. Also, the many good recipes and eating ideas you provide are very helpful. I never thought I was a competitive person but when I saw the pounds coming off, I thought I could win this and almost did. JOEY: And how did exercise fit in? BARB: Working out in a structured environment really helped me lose the weight too. Having a planned class to go to at The Fitness Connection was key. I attend your strength classes 2x/week. It’s motivating to attend your classes because you expect us to be there and wonder where I am if I don’t come. When we miss class, your emails wondering where we are, are very motivating. I also take long walks with my dogs, and I did 2 exercise routines at home each week. You are so good about freely giving us programs we can do at home and I like the one you call The PHAT workout and I do that regularly. Exercise keeps me mentally fit which in turn helps me to restrain from indulging or over eating when I am stressed. When I finish working out, I feel great about myself – just like The Fitness Connection ads always say. It really is true! JOEY: What do you do to stay motivated? BARB: On the days when I am unmotivated and want to just lay around, my dogs stare at me in a mournful way and I am compelled to walk them. So that really helps! I eat when I feel stressed so I replaced that with cleaning or getting other tasks done at home which made me very productive. As I age, I want to maintain healthy bones, and to be able to do the outdoor activities that I love. Nothing would be sadder than to be stuck inside because I didn’t have the strength to go for a hike or to travel. JOEY: Are you worried about gaining the weight back? BARB: No way. I don’t think about future failures. And I am back in the groove with your new challenge and I plan to win this time!! JOEY: Barb, I think it is just so great that you lost so much weight. In fact, you lost more weight than Laurel, the winner of the Transformation Challenge! (Just to let the readers know, the Challenge was based on the greatest percentage of weight loss rather than total pounds lost.) I truly admire what you accomplished and I am so proud and very happy for you. Thanks so much for sitting down with me and I expect to see high numbers in the new Challenge!! See you in the gym! JOEY: Hey Kay! Fabulous job losing weight during the Transformation Challenge. You just took me by surprise because I wasn’t paying a lot of attention and all of a sudden you were a true threat! Tell the readers about yourself. KAY: I am a breast cancer survivor of several years. After treatment from chemo and radiation, I went into menopause. I gained at least 20 pounds over the last 5 or 6 years – a little at a time. It really sneaks up on you - especially when you get into my age bracket. I am going to be 60!!! I lost 16.25 pounds during the 7 week challenge. JOEY: 16.25 pounds in 7 weeks is so great! Had you ever tried to lose weight before? KAY: I did. I had some success with the Adkins Diet but never fully committed to changing my eating habits. Any weight loss I did have always came back on. I love to eat meat so I thought it was a diet made for me. I’ve never been on any other particular diet plan as I don’t have the patience to weigh food, count calories and do all that was involved with most diets. That’s why your “clean eating” program works so well for me. I can eat a lot of food and make it taste delicious and just eyeball portions based on your rules of thumb for clean eating. JOEY: So tell the readers exactly why you joined the Transformation Challenge. KAY: I knew I had to make a commitment to eating healthy and I also knew the key was staying focused. I was the heaviest I have ever been and something had to change. My scar tissue around my breast was hurting me and my body didn’t really feel that good. And my energy levels were so low – I just felt like it was all falling apart. The Challenge was only 7 weeks so I thought that was very doable and I hoped it would keep me on the program of clean eating. I was already working out with you – I have been for about 3 years – but the eat piece was missing. Your food coaching really helped. JOEY: So how did you do it? KAY: I think it was staying focused and following your healthy eating habits based around clean eating. I worked out with you 2x/week and adding some workouts at home did the trick. I have to re-iterate that I do not like to measure, count calories and go crazy over diets so I was really doubtful that eating every 3 hours would work. But guess what? It was so EASY! JOEY: What tips can you offer someone trying to lose weight? KAY: The best tip I can give is to eat all the time as you advise. IT WORKS! Planning is key as we know and I must say I would get into a rut but it was my routine of eating that worked. When you eat healthy, you have to be very aware of your water intake which aids in weight loss. I literally counted the bottles of water every day as I wouldn’t do it if I didn’t count how much I was drinking. JOEY: YES! Water is so key! You say that all the time. You also always say that this was actually so easy for you – the clean eating. I really want the readers to understand that it is SO easy and it works SO quickly! Can you give us some examples of how you eat? JOEY: I always say that fit people eat the same food almost every day at least until dinner time. It works! So what about lunch and dinner? KAY: I often have a salad with grilled chicken strips on top. I don’t use dressing. I just got used to that although, sometimes I would use vinegar or lemon juice. Sometimes I threw that all into a whole wheat wrap. Dinner is usually fish, chicken or turkey – not much red meat – or a turkey meatloaf with veggies on the side. I also make a lot of great soups and some great low carb recipes. That was it. No cookies, cake or anything with sugar. Eating every 3 hours was key. That’s basically your plan and it works. JOEY: Exercise was and is a major part of your weight loss success and you give it proper credence along with the changes in your diet for helping you reach your goals. What exactly do you do for an exercise routine? KAY: My plan was working out twice a week with you and then kicking it up on the off days as the weeks went on by jumping on my mini trampoline to music to get my heart rate up. I also worked out on a cross trainer for 40 minutes and did 20 minutes of Pilates as I got into week 5, because I wanted to burn more calories. KAY: I’m not always motivated to get up and go. But I always remember that when you do get going, you’re going to feel a lot better. I hate getting up early some mornings but I know that later on, I will regret it. Twice a week isn’t bad. I come to your 7:30AM class and in all honesty, I LOVE the women in my class so that really motivates me to come! I’m more of a night person, so I exercise in the late afternoon, on the off days from The Fitness Connection. I know you have heard this before – but if I can do this, anyone can!!! Believe me – I’m not obsessive or fanatical about anything. This was really easy for me! JOEY: Did you have any stalls along the way and what did you do to keep your head in the game when that happened? Did you change anything about your routine from the norm? KAY: The only stall I had was at the end. I went on a plan you gave us where you can lose 5 pounds in 6 days with a very clean, strict, low carb, food plan. I was ready and geared up for D-Day and then you got sick and we had to wait about 5 days before the final weigh-in!!! (How dare you!!) I just couldn’t keep going. Between grandkids and family commitments, I got off track. But still! Over 16 pounds!!! JOEY:Do you worry about gaining back some of the lost pounds? KAY: I’m not worried about it. If I do gain some back, I plan to catch it quickly and jump back on the clean eating plan. I’ll know exactly what to do and the best thing about it is that I found it so easy, it won’t be prohibitive. I have definitely cheated the last few weeks but I’m not beating myself up and I haven’t gained anything back. But, I know I need to re-focus and continue with my healthy eating routine. It’s ok to be off track and enjoy it. That’s why I love working out! As long as I work out enough, I feel I can eat a treat or a cheat meal or have some wine and it’s not going to mess it all up. Food is an enjoyment of life and I love to cook. I’m staying away from bad calories and enjoying the good. I also have cut back on alcohol which has all those empty calories. I honestly don’t miss it but I enjoy a glass or two once in a while! JOEY: Well, Kay – I think you get it! And I love that you found it so easy! I really hope the readers pick up on that and try on clean eating for themselves. Thanks SO much for sharing your story and I plan to bug you endlessly to make sure you stay focused. It’s what I do! JOEY: Hi Priscilla. Thanks so much for doing this interview. I just know some people are dying to hear your story. You’ve lost 40 pounds and 10% body fat. That is such a huge accomplishment and I am so proud of you. I see you working so hard in the gym and I know you do Aqua Aerobics also. Your motivation truly inspires me and I hope other women read this interview and become inspired also. Why don’t we start by you talking a little bit about yourself? PRISCILLA: Well - I am 47 years old – soon to be 48 in a week! I am married with a teenage daughter and I‘ve worked in a retirement community for 12 years. I’ve been watching my weight forever it seems. I grew up with 4 brothers who were always teasing me and I took everything they said to heart. I wasn’t ever really that heavy but I saw my self that way. I gained weight when my daughter was born but I lost it within a year or 2. But then it came back on and I couldn’t seem to get the weight off or if I did, I would quit a few weeks into the program. I couldn’t understand why I was hardly eating anything some days and I still continued to gain on the scale. I decided to call you for help in the hopes that you could change things for me. JOEY: I am willing to bet you were surprised when I told you that working with a personal trainer will help but typically you won’t lose much weight! Particularly women over 40. Of course, now you know that working out is only part of the prescription for losing fat - that you could work out every day of your life and still not lose a great deal of weight/fat. I always get a laugh when I tell new clients that. Of course, I clarify it with a talk about the real work being done at home, changing the way you eat. I think I say this several times a day - you can’t out train a bad diet! Obviously – you understand that concept now. So, when you first came to me in early 2007, you weighed 199 pounds. The thing that impressed me about you was that you seemed determined to lose weight and you were hoping that working with a personal trainer would be the ticket. I remember thinking that you might make a good before/after client and I asked you if you were willing to put a “before” shot in one of my ads and then thru the months, my website and ads would follow your weight loss journey. In retrospect, that was a HUGE request on my part and an even bigger risk on yours. I think I freaked you out, but a few days later you called me and said, “Let’s do it!” I think I was right about your motivation. Unfortunately, shortly after you started working with me, you took a fall and injured your back. I know you had a difficult time recovering from that injury but about a year later, you called me and said you were ready to start working out again. I was completely shocked when you walked in the door because you had dropped a considerable amount of weight and you actually looked like a different person to me. At that point, how much weight had you lost and how did you do it? PRISCILLA: I believe I had lost about 20 pounds at that point. I had been following Weight Watchers for about 5 months when I started back with you. I also was doing Aqua Aerobics. JOEY: Why was this, finally the point in your life where you realized, “I’m really going to do it this time”? How motivating was that? What made you, after so many failed attempts to lose weight permanently, finally do it for good this time? What was the spark, the impetus, the "aha" moment that told you this time would be different than before? PRISCILLA: My health is very important to me and I have a Mom who is going to be 75 in a few weeks and she works out 5-6 days a week! She always had problems with her weight but at the age of 50, she started really taking care of herself and now she feels great. I think that had a lot to do with my state of mind and motivation before the back injury. After I injured my back, the recovery took a really long time. It began to sink in that I truly needed to lose weight to help me recover from my injury, that I needed to strengthen my back and get healthier or I might very well be in pain for the rest of my life. I knew I couldn’t fail this time because I was heading to 50 and if I didn’t start taking better care of myself, I could be in big trouble – health wise. So I think I succeeded this time because of my health concerns and my Mom as an inspiration. JOEY: Your health is a pretty good reason. Interesting that it wasn’t about what you looked like anymore, but about your health. If more people started thinking that way, maybe it would be more of a motivation. To what do you credit most for your weight loss? Changing eating habits? Exercise? Change in thinking? Something else? PRISCILLA: I definitely think following Weight Watchers was instrumental in changing the way that I eat. And as you’ve said, it’s all about the food. You always told me that clean eating would take care of losing the fat and that working out would re-shape my body and that is exactly what happened. I did the Aqua Aerobics to burn some extra calories and I started strength training with you again and lost another 20 pounds. I think the strength training is what really changed my shape. Building muscle has leaned out my whole body. I feel like I look fitter and I am better proportioned. My lower body is so much smaller. I’ve lost weight before but never looked like this! PRISCILLA: I strength train at your gym 2-3 times a week and I do Aqua Aerobics twice a week. For anyone that has never done one of your strength classes, they are great. I love the way you mix it up – some days doing all dumbbell work, other days doing circuits both with weights and utilizing body weight. I also like that you do at least one day of strength training that incorporates high intensity intervals in between strength moves. I feel like I am getting that 3rd cardio day in the same amt of time I’m strength training so it’s more bang for my buck, so to speak. The fact that the classes are always less than 8 people is great too because you are always watching us. I don’t know how you do it, but you are always fixing my form or giving me a modification for the exercise so I don’t hurt my back. And you do this with everyone in the class. It’s great! JOEY: Thanks for the compliments! I absolutely love what I do so I think that helps make me a better trainer. I just love the energy I get from the group setting. But back to you, my readers will be especially interested in hearing that you did Weight Watchers to gain control of your eating. As you know, I don’t necessarily promote any specific diet plan since we are all different and must find our own path – that people should find the plan that works for them, follow that plan as prescribed, and then keep doing that plan for the rest of their life. What led you to try Weight Watchers and why do you feel this is a diet that "is as good a place as any" for people to begin with? PRISCILLA: First of all, I never use the word DIET. The first 3 letters spell DIE – need I say more? I call my new eating habits “a healthy life style change”. I plan to eat this way for the rest of my life. I was never one to try all the fad diets but I had tried Weight Watchers several times before and always gained back the weight I had lost. But I like Weight Watchers specifically because there are no restrictions on the type of food you can or can’t eat. It’s portion control more than anything else. So this worked for me. But the thing is, I was never working out before so that really changed everything. I watch my portions carefully but I know that my strength workouts keep muscle on my body and you have always told me that muscle burns more calories daily than fat. So I think that really helps when I over indulge. And the intervals we do during your classes and the Aqua Aerobics I do twice a week burn more calories, so I think the combination helps keep the weight at bay. JOEY: What tips would you offer someone trying to lose a significant amount of weight like you have lost? PRISCILLA: You really have to clean up your diet. I fill myself up with lots of veggies and fruit with all my meals and I also drink a lot of water. I still have my favorite foods but just in smaller quantities. If I over eat, I feel so uncomfortable and if I have overindulged, I always start right back up with the clean eating the very next day. I also recommend that anyone who wants to lose weight should definitely start weight training. It changes everything about you. I had to start all over again after my injury and you were right there – telling me to take it slow, that I could do this. With your guidance and praise, here I am 40 pounds lighter! I haven’t felt this good for many years. I am a better woman today, knowing and working with you. I have my confidence back and I am so happy! I love telling my story to people and letting them know that they can do it too if they just take small steps. I tell people to start off with a goal of about 5 pounds a month and by the end of the month you will probably have lost more that that. I never deprive myself of any of my favorite foods. I just eat smaller portions. When I work out in your strength classes, I work harder than I could ever imagine doing on my own. You just push us so hard but it’s all great. I definitely recommend working with a trainer. PRISCILLA: Looking at my BEFORE picture!! I can’t believe I EVER looked like that! PRISCILLA: Believe it or not, when my weight loss stalled, I ate more! I think I needed more protein. You always say that most people don’t eat enough rather than too much and it’s true. I used to starve myself and could never figure out why I wasn’t losing fat. I also exercised more when I plateau’d in my weight loss. I think that helps to break the cycle. JOEY: How do people that have not seen you since your weight loss, react to you when they see you? PRISCILLA: My brothers saw me over the Christmas holiday and they couldn’t believe it was me! And my 34 year old nephew said I really looked HOT!! It was so great to see them and hear their kind words. My mother still does not know how much weight I’ve lost since this summer and how hard I’m working with you, so I can’t wait for her to see me. JOEY: Do you worry about gaining back some of the lost pounds? PRISCILLA: Oh - definitely. So I keep on doing what I do. I cheated through the holidays but I didn’t pig out. I definitely had more chocolate! I don’t know if I gained weight but I know I will definitely get back to the clean eating and the exercise come January 2nd! JOEY: How do you stick with it day in and day out? Any advice? PRISCILLA: That BEFORE picture! The one thing I advise people to do is drink lots of water. I try to drink 30 oz. while working out and an additional 50 oz. during the rest of the day. It’s great for every part of your body – especially your skin! JOEY: What are some of your fitness goals for the future? PRISCILLA: I definitely want to maintain my weight loss and maybe even lose a bit more. So I plan to keep eating clean, smaller portions. I try to eat 5 times a day – 3 meals and 2 snacks - so I plan to continue doing that. I also plan to stay with you, strength training at The Fitness Connection. I want to up my strength training to 3 days a week so I plan to take a Saturday morning class with you in addition to my regular Tuesday/Thursday schedule. I also plan to continue the Aqua Aerobics. I really want to start seeing some muscle definition. I know the muscles are there, I just need to uncover them and continue working on getting rid of that last layer of fat covering some of my muscles. My hope is that clean food and a little more strength training with you guiding me, will get me to my goals. JOEY: I really look forward to continuing to work with you, Priscilla. Thanks you so much for doing this interview with me. Your journey has inspired me and I think it will inspire others to work on changing their bodies. My goal is to make women feel better about themselves by helping them to lose weight - guiding them through the process. I am so happy that you feel so great about yourself and I am so grateful to have you for a client. Keep up the great work and I will see you in the gym!